-10% Early booking discount till 30 Nov 2017! 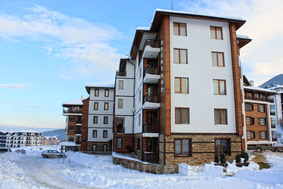 Location: Predela 2 hotel is located just 700 m from the gondola lift in Bansko. The resort's centre is also just 1 km away. Accommodation: Predela 2 hotel offers 14 cosy studios, 10 apartments for 2 guests and 12 apartments for 4 guests. All apartments offer a balcony with a beautiful view to the mountain. The rooms offer a fully fitted kitchenette and a comfortable sitting room with a folding sofa. Flat TV with cable television and free Wi-Fi are also provided in the apartments. Wine & dine: Light snacks and refreshing drinks are served in the hotel's cafй bar. Spa centre: Hotel Predela 2 offers a modern spa centre with indoor swimming pool, fitness hall, hydromassage bathtub and a sauna. Massage services are available on request. The youngest guests can enjoy an exciting day out in the open air children centre, next to the hotel.